One of my favourite toys from last year was this awesome Lego set from the popular Bionicle line. Released alongside the Exo-Toa, the Boxor was the better deal - including an impressive Bionicle vehicle for the good guys, complete with a "Matoran" villager figure all packed into one well-priced set. 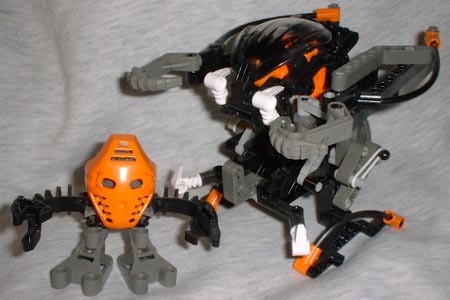 In the darkest moments of the struggle against the Bohrok, an Onu-Koro Matoran named Nuparu made an astounding discovery. The Bohrok, he learned, are not living creatures - instead, they are biomechanical creations designed to transport the krana. Using this knowledge, and parts from a downed Bohrok, Nuparu constructed the Boxor vehicle. This rugged transport gives the Matoran added power against the Bohrok Va, and a large number of Boxors can even defend successfully against a squad of Bohrok. 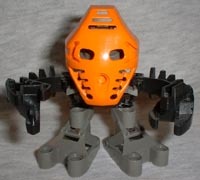 Nuparu is the same design as the Bionicle Happy Meal Matoran (nee "Tohunga," before Lego began politely removing as many real-world Maori terms from the story as they could), with the strange "hunched" body, bendy arms and an oversized mask - he's only missing the disc to throw! Instead, he gets his own (much cooler) unique accessory, the Boxor. The Boxor is a completely bizarre little gadget - I'm tempted to call it an automobile or a robot, but it's neither. It's more of a protective robotic armored suit with additional fighting ability, kind of like a mini-Mechwarrior, or the ATAX armor from Aliens. In a different environment, a vehicle like this would have been armed with guns or missiles, but because this is part of the considerably non-violent Lego Bionicle, the Boxor is instead fitted with twin claws, automated in an inspired "boxing" action feature. Simply tip the Boxor to the side, applying pressure to one leg, and one of its two claws will shoot forward on a long mechanical arm, punching an enemy with considerable force. You can tip the Boxor from side to side for a combination punch attack or just press down on the whole thing for a double attack. It's strange but ingenious - using a combination of elastic bands and bendable Lego pieces, the inner workings of the Boxor allow it to perform one of the niftiest action features seen in 2002. You have to see it in action to appreciate how weird but awesome it is - the Boxor has a truly unique and creative design. 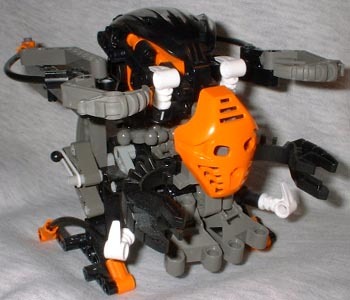 The look of the Boxor fits well into the Bionicle universe - the colorscheme is simple with black, grey and orange, the same colors as the driver Nuparu. The Boxor is designed with an array of different Bohrok and non-Bohrok pieces, including features like two tractor-type "feet" for off-road terrain, the shell of a Bohrok as overhead protective armor, and Bohrok teeth as levers for Nuparu to drive the Boxor. Nuparu sits in the Boxor easily - the overhead protective armor lifts up on a hinge so he easily sits on his little seat, his hands on the levers, looking plenty nifty. The Boxor also has another model, a taller vehicle with big swinging arms instead of the cool punching feature. It's got nothing on the normal Boxor but it demonstrates the creativity of the set nonetheless. Overall, this is a must-have for any Bionicle fans. The nifty action feature, the new villager figure, the nifty look of the entire set, it all combines for a very kewl-looking piece of engineering that sits well in your Bionicle collection.